There’s something so satisfying about photographing what you do everyday. 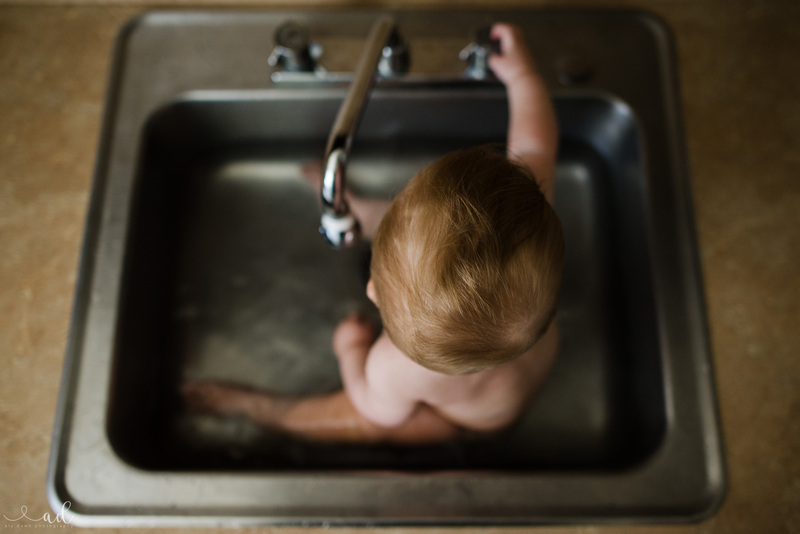 Before I had my son, my everyday was very boring. It consisted of work, eat dinner, sleep, repeat. My weekends were exciting. 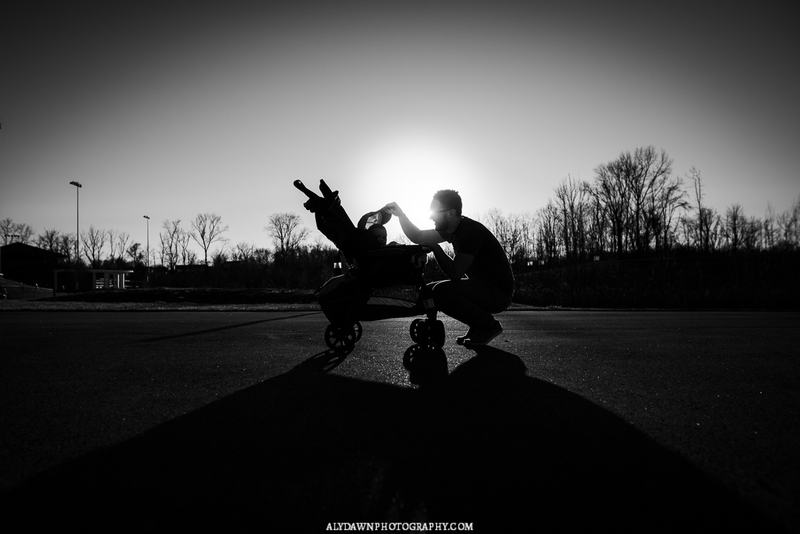 But anytime my photography friends wanted me to do a Day in the Life … I couldn’t! I couldn’t figure out how to create images that showed my everyday. If you have kids, it’s a different story! There’s plenty to do and plenty to take pictures of to show your everyday. 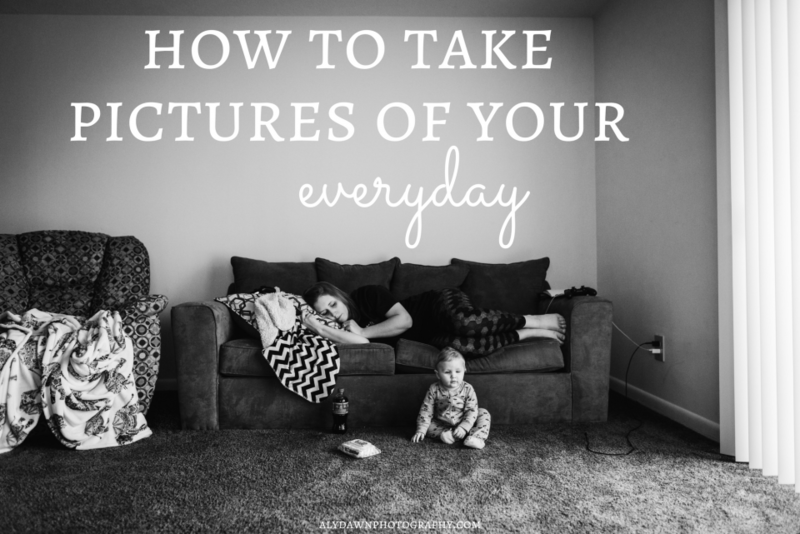 I am going to give you some tips to taking pictures of your everyday. And yes. It is possible even if you work a full day. Don’t be discouraged! You can still make time for photography. Let’s dive in. Honestly, one of the best ways of photographing your everyday is taking place in a day in the life. A day in the life means that every hour (it could really be flexible … every two hours, twice an hour, at least 30 photos in the day, etc.) you take a picture of what you’re doing, essentially. These photos don’t have to be amazing. But they do have to show what you are doing throughout the day. 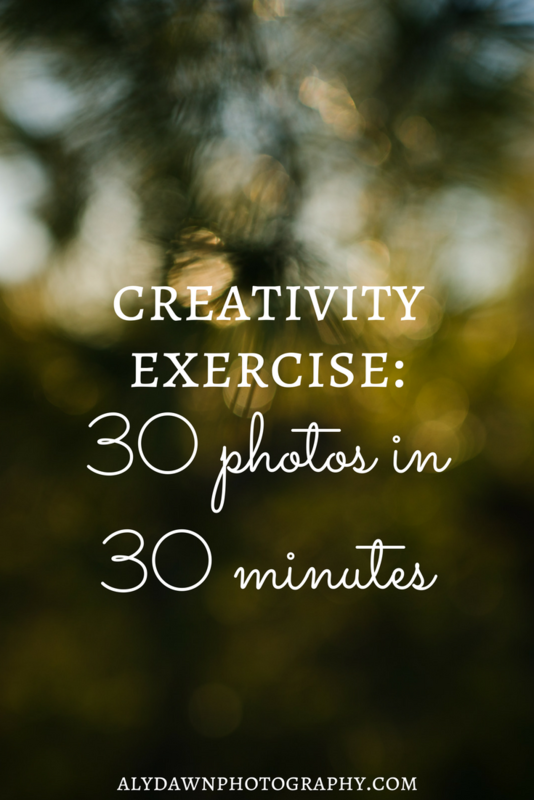 This is a great photography project to try, if you haven’t already! (I should do one … they are really fun. I’ll do one if you do one!). it makes your everyday exciting again! it challenges you to take something simple and make it amazing! How can you photograph breakfast and make it exciting?? it (hopefully) gets your creative juices flowing. Alright! 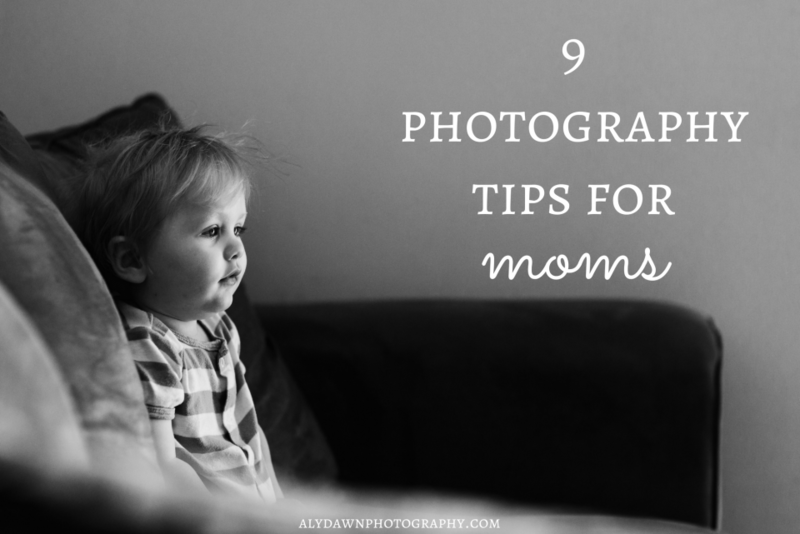 Are you ready for some down to earth tips on how to photograph your everyday? Ready? Set? Go! First and foremost … what does your ‘everyday’ look like? Is it super busy? Is it relaxed? Does it change from day to day? I want you to write down what your typical day looks like. Planning your shots make it so much easier to get the exact shots that you want. Write down what you do daily and how you could make the daily stuff exciting. There’s something you do daily. Whether it’s put on makeup, making breakfast/lunch for your kids, taking a walk, playing with the dogs, getting ready for the day, etc. This is the type of thing you want to capture. If you think it might be boring, that’s ok! Try to capture it anyways! Something I love to capture that happens daily is nap time. 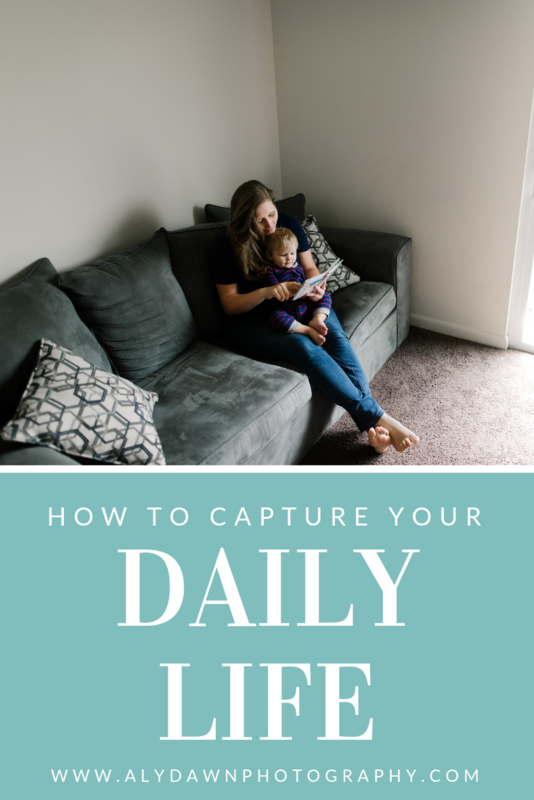 The reason you might want to capture this daily stuff, is because it might be daily right now, but years down the road, your daily life might change and you might forget what it was like. Nap time might turn into play time, and eventually those littles will be out the door (insert sobbing face here!!!! ), so capture those sweet moments and memories. They might not seem like much now, but they will later in your life. So … what do I mean by stage? If you always have a perfect scene in your house, you will see me bowing down to you … teach me your ways! 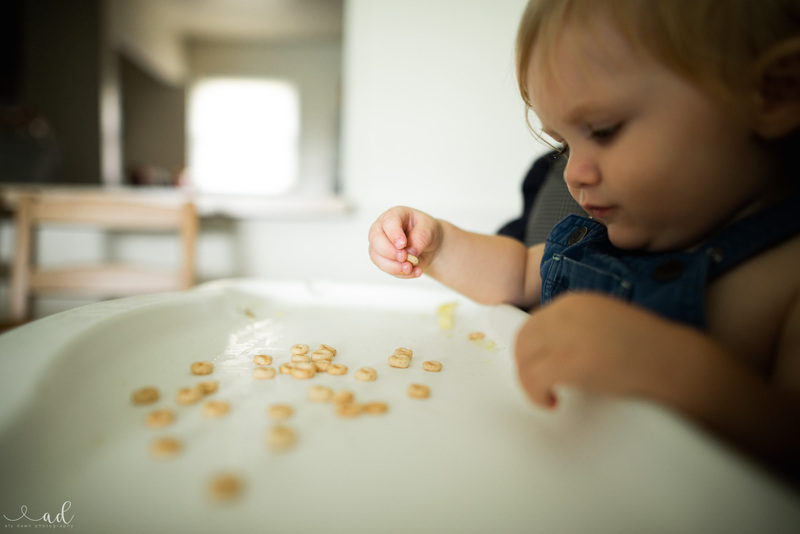 If you are a mom of littles, I know your house is not always picture perfect! You can set the scene up to make it look like it’s perfectly clean. Simplicity and cleanness make your images look more professional. That being said … sometimes the mess adds to the story. Folding laundry? Being buried alive? Leave the laundry piles in and show your exasperated face! 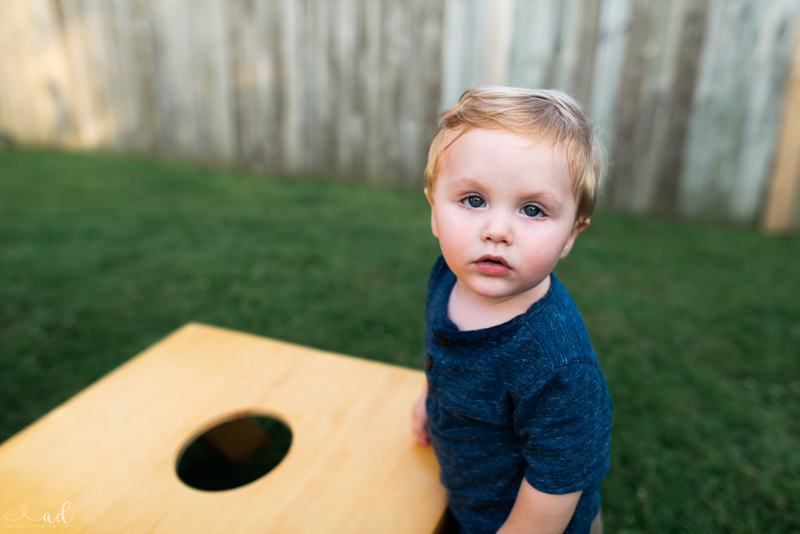 Set the stage by cleaning up the scene, but this could also mean bribing your littles to get the photo you want. Are they playing with a board game in horrible light? Move them (ever so sneakily) to a place with beautiful light and have at it! Think before you shoot. Set the stage before you shoot! So when I did my first day in the life … I was working full time! I decided to take my camera to work and to photograph what I do throughout the day. I was so scared. Nobody asked me what I was doing, but I was so self conscious. I didn’t get the images I wanted because of it. Don’t do what I did. Instead, be brave! Now that I’ve actually shot more in public I am here to tell you that no one is watching. And if, for whatever reason, they are, it really doesn’t matter! This is your work. This is your day in the life. 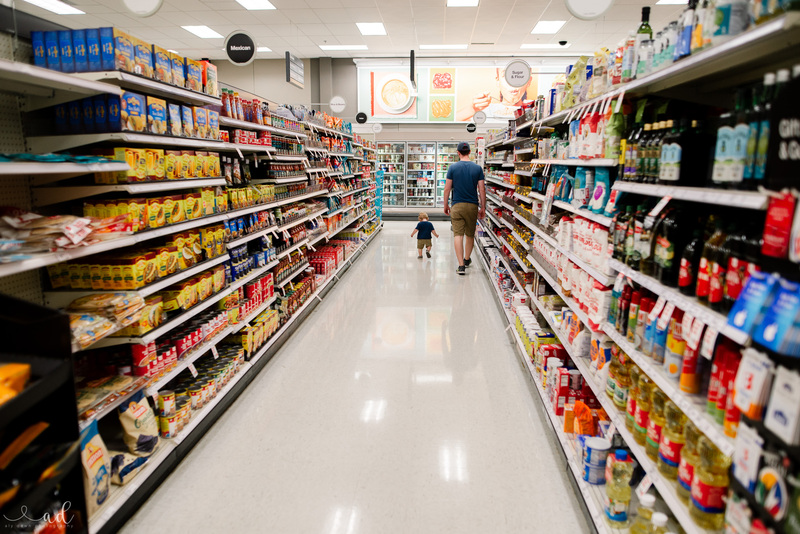 If your day in the life includes a trip to Target, take that camera with you! Do it. If your day in the life includes going to a public park, take that camera with you! Sometimes people ask me what I am photographing … and I’ll tell them and that’s that! They really don’t care, and you most likely won’t see them again. So, who cares? Be brave! Take your camera to Target (I love Target pictures!) 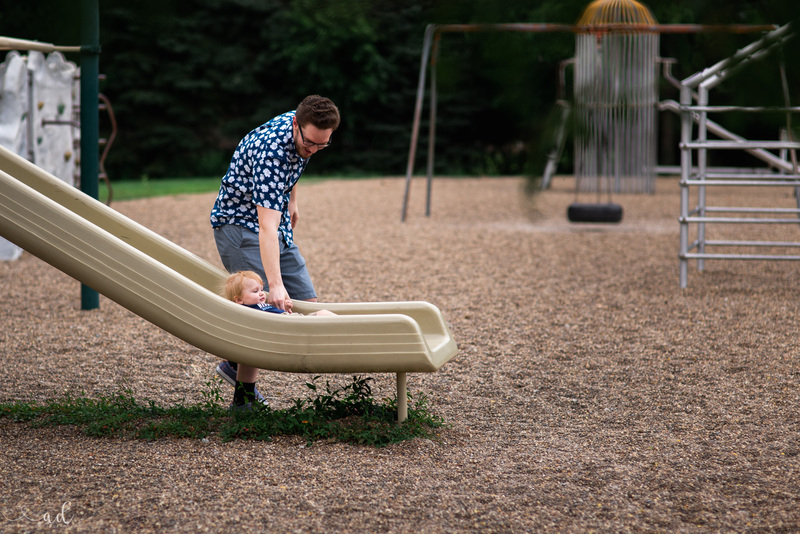 take your camera to the park! To the Library! To Kroger! Always have your camera with you and don’t be afraid to take it out. Mom’s are constantly taking pictures with their phones, so what’s different about a big camera? I used to be terrified of taking pictures with my big camera out in public. I once got asked why I had my camera with me and I just simply said, ‘You never know when a moment will happen!’ They legit thought I was crazy!! Now I’m totally fine with having my camera out. It doesn’t bother me if I get looks (but to be honest, I very rarely get looks, everybody is worrying about themselves). I take the pictures I want to take! I mean, you are part of your daily routine, I would hope! So don’t be afraid to get in the frame with your kids. If you don’t have kids, don’t be afraid to jump in the frame! Getting in the frame adds to the feeling of ‘day in the life’. These images don’t have to be perfect. They really don’t! They just have to showcase exactly what you do each day. And later down the road, your children will be so excited to have pictures of you! If you are new to taking self portraits, you’re in luck, I have a self portraits post you should check out! My number one tip is to set up a tripod (or put your camera on a flat, safe surface) and to set up an interval timer. You will want to pull out your camera’s manual to see how to do it for your own camera. If you have a remote for your camera and want to use it for self portraits, I recommend putting your camera on a delay so that you don’t get pictures of you pointing a remote to the camera. Been there, done that. So I always say when you are new to photography, you need to practice on subjects that don’t move. And what better subject than your own sleepy kid! They’re so cute and definitely photo-worthy! Practice getting different images each day with nap time. Think of new ways to capture nap time. 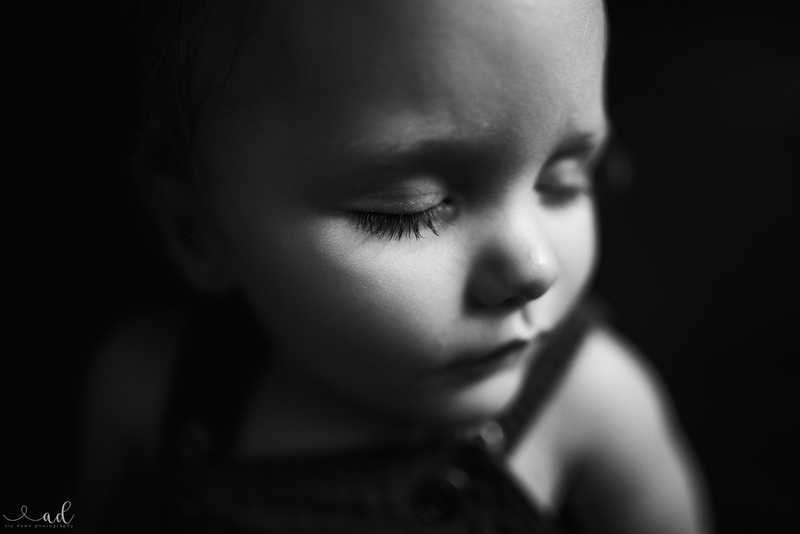 One day you could focus on the details, like their sweet closed eyes and their long lashes. Or their cute toes. Or the way their mouth looks when they’re relaxed. The next day you could practice framing them using doorways or the crib. Think of how to use the light creatively. There’s so much to do with nap time! 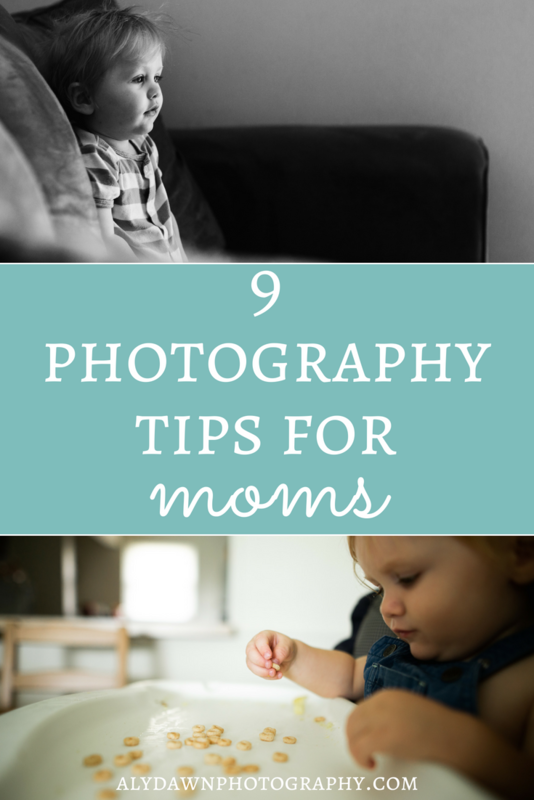 Pro tip: the camera’s shutter can be too loud and wake your child. That’s no good! You don’t want to interrupt their nap time! Some camera’s have a quiet shutter option. Look in your camera’s manual to see if you can turn on a quiet shutter. It makes your shutter a little softer and hopefully won’t wake them up. Once you get the shot, put it away, and really spend time with your family. There was one time that I was itching to take a certain picture … but I could tell that my son just wasn’t having it. So, instead of giving myself a headache, I put the camera away, picked up my son, and we played and had a great time. Do that. Family is way more important than the images you take. Trust me. Spending time with them is exactly what they want. Giving them a break from the camera could actually get them more comfortable in front of the camera (could we call that reverse psychology?). Just remember to have fun and make sure your children know you aren’t just having them to take pictures of them. :’) Happy shooting, mama’s! If you are new to my blog, welcome! Starting in March I will be posting a creativity exercise every month! So if you like getting inspired, come back on the first Sunday of every month for a creativity exercise. These exercises are meant to push your creativity to the max. Do you feel like you’re in a rut? Do you feel like there’s something you need to work on? These creativity exercises will definitely push you and make you think. One thing I absolutely love about photography is how there is always something new to learn. It doesn’t matter how advanced you are in your photography journey, doing a creativity exercise every month will challenge you and improve your photography. And I’m going to do it with you! The reason I decided to do this exercise as our first challenge is because I LOVE photo walks. And I also love trying to get 30 different images. It’s harder than you might think! Each person sees the world differently. If you had two photographers go on the same walk at the same time, their 30 images would be completely different. So, are you ready to dive into this challenge? I’m excited to see what you have produced! This one is super simple. All I want you to do is go to a outdoor location, take a walk, and get 30 photos in 30 minutes. Pretty great, right? I went on a walk on a beautiful day, with lots of sun, around golden hour. You could challenge yourself further and choose a harder time to go. Like mid sunny day, or a rainy day. Challenge yourself and have fun! Any outdoor location will work, really. The beach, a garden, your neighborhood, your driveway, a park, etc. It doesn’t have to be some grand location, though. The only ‘rule’ is that you want to stay in that one location for all 30 photos! The idea is that you push yourself to get 30 different photos in this location. Have you been passing by a place you’d love to shoot? Go there! Or you can push yourself further and photograph a place you shoot often. There are so many options for picking your location. 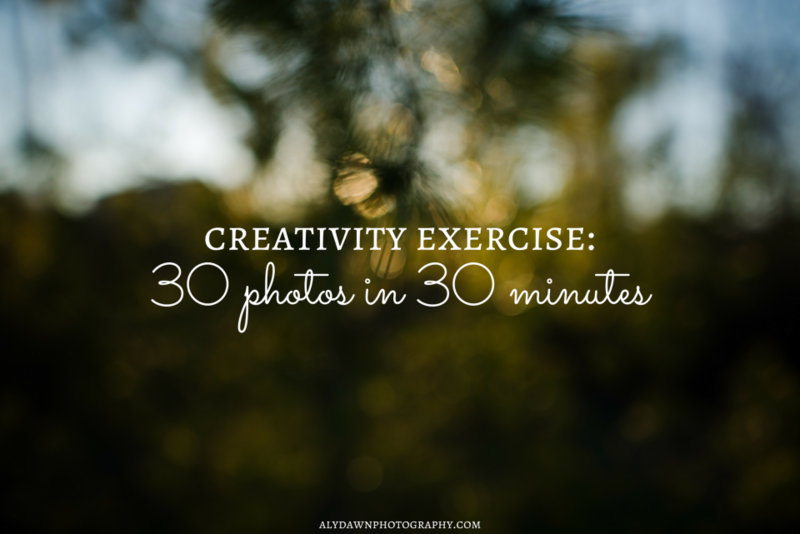 You are trying to take 30 unique photos in 30 minutes. Getting unique photos is challenging enough, let alone in 30 minutes in one location! Each photo needs to be unique, but it doesn’t need to be of different subjects. Choosing to shoot the same subject in different ways is all part of this challenge. The photos don’t have to be your best work, they just have to push you creatively. In theory, this exercise will help you in getting unique photographs in one location. For example, if you are shooting a senior session, you now have the skill to take 5 different shots of the same subject in the same location. 5 unique shots before you have to move on from that pose or location. That’s a very handy skill to have. 30 minutes, guys. That’s it. Set a timer. This is all part of the challenge! It’s OK if you go over your time, but having a goal of 30 minutes is a good idea. I’m pretty sure I went over my time limit by like 10 minutes. And that’s OK! From a different angle. Stand up on your tip toes, shoot down. Lay down on your belly and shoot up. Using different composition. Try using framing! Using a different aperture. Take one of the same subject at wide open, then stop down. Which one do you like better? Of people – portraits are definitely allowed! Using the available light differently (from above, the side, backlighting, etc). 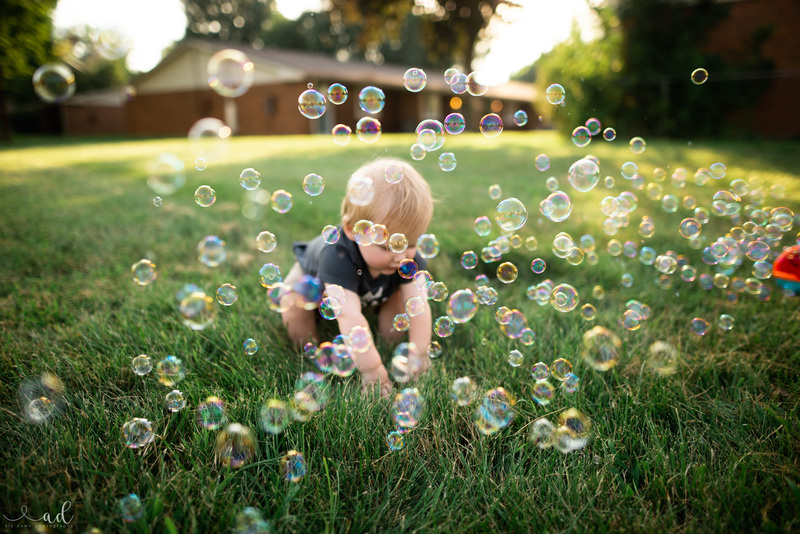 Of moving subjects – freeze them or show the motion. There is a limit on your time and location, but your options are limitless to what you can shoot! I did this exercise a couple of days ago! I found it so therapeutic. I did it the day I found out my grandfather died and I was needing a way to cope with it. Photography definitely did that for me. Although I loved this exercise, I did find it challenging! My walk was filled with a lot of dead stuff. Like, a lot of dead stuff. It’s just starting to warm up here, so no signs of spring yet. I liked the challenge, though. I think it definitely pushed me creatively. 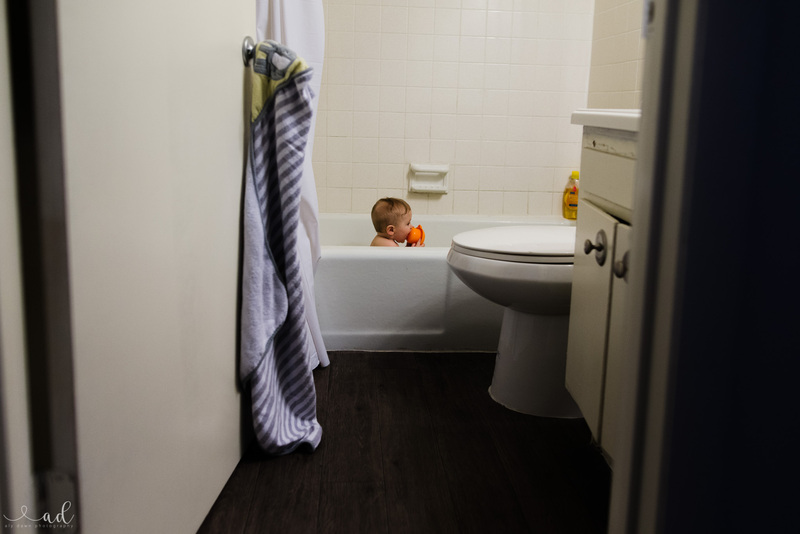 I was really trying to not ONLY photography my husband or son. I couldn’t resist some of them, though. I mean, look at that light! I was in heaven. But I was really worried I wouldn’t get 30 images! I managed to do it, though. Here’s my 30 images in 30 minutes!! All images taken with my Nikon D610 and my beautiful Sigma 24mm 1.4 – definitely my go to lens. Be sure to #alydawnphoto and #alydawn_creativity on Instagram so that we can all stay connected! I know it’s a bit hard to share 30 images on IG, but you could share your top 10! I’d love to see them! What did you find hard about this challenge? What held you back? Can’t wait to see everyone’s images this month. Catch me next month for the next creativity exercise! I’m so excited to be doing these with you. want to be notified of a new creative challenge? Sign up to be notified of new creative challenges! Get started in photography and take control of your camera. I think it’s pretty obvious that I am passionate about photography. And trust me when I say, that I’ve been in your shoes before. Starting out, not really sure where to even begin with my photography journey, stumbling along without any help. Well, I would like to give you something I never had: help! 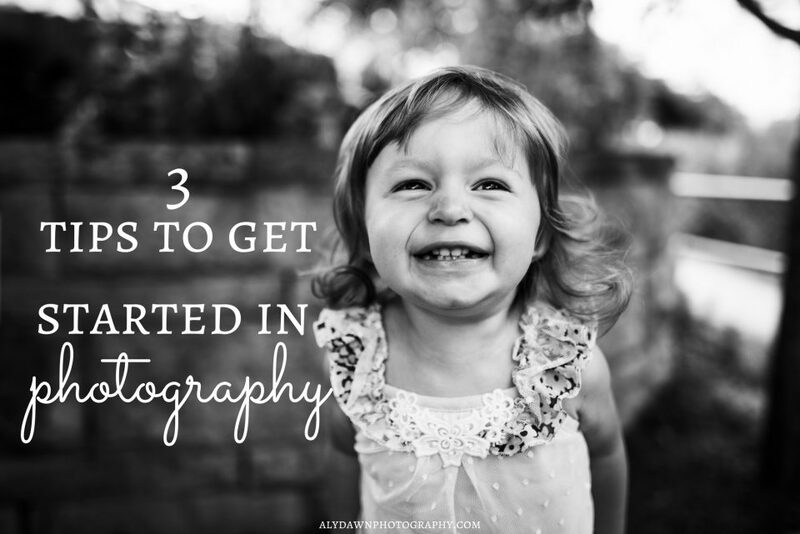 I want to give you 3 tips on how to get started in photography. I started off with no knowledge and just a cheap point-and-shoot camera. Now, I have a lot of knowledge, a fancy Nikon D610, and a beautifully sharp Sigma 24mm 1.4 lens. But it took time to get here. And I want to help you get started! I have discussed briefly different parts of my photography journey. Allow me to go into a little more detail. I have always loved photography. I remember one time my mom got me a little cheap film camera (the disposable ones – everyone had them!) and I took about 20 pictures of a ‘deer’ in our backyard. Only, you couldn’t see the deer at all. Alright, so I might not have always been the most amazing photographer out there, but I have always loved photography. My dad got me my first DSLR as a graduation gift from graduating high school – I was hooked. I thought I was taking fantastic images (looking back – yikes! I have improved a lot!) with my beginner camera, the Nikon D5100. I loved that camera – and still do! It took fabulous pictures. I recommend this camera to every beginner photographer out there. It’s a great first camera. But I still wasn’t learning anything. It wasn’t until December of 2014 that I finally realized I knew nothing. I couldn’t even tell you what type of camera I had! Umm….a Nikon? I had no idea what any of the numbers on my lenses meant – I didn’t even know that I only had ‘kit’ lenses, which are the lenses that come with your camera and – news flash- they are not the greatest. I also had no idea about manual exposure, what’s aperture? What’s shutter speed? I am happily taking pictures on auto! the best thing I did for my photography! Well, January of 2015 changed everything! 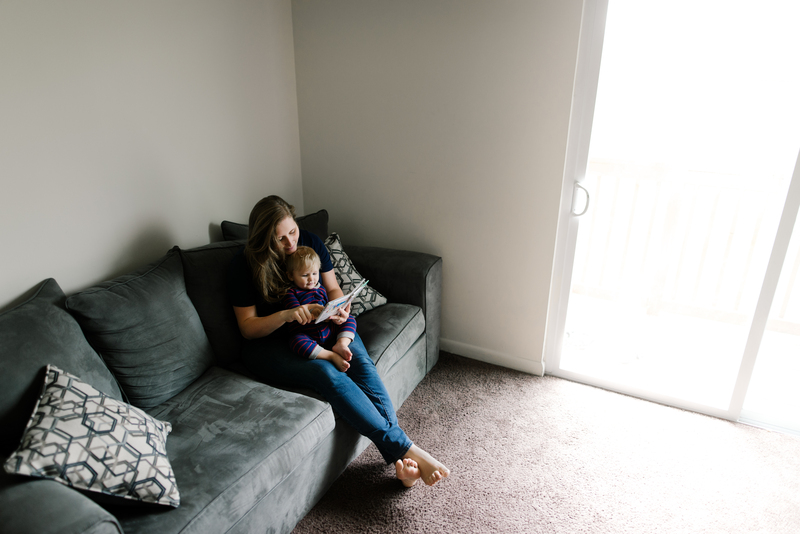 I took a leap of faith and signed up to be a Clickin Moms member. I want to point out, I was not a mom at that time. You don’t have to be a mom, or even a woman, to sign up! Give it a shot – it’s a wonderful community. After that I signed up for my first class, Mastering Manual Exposure. I was determined to learn more about my camera and photography. I have not looked back! That was the greatest decision of my photography career! The best thing about photography for me is that there is always something new to learn. I am constantly learning new things. Definitely take classes. Learn manual exposure through a class. I would recommend against trying to learn manual exposure by yourself. I tried it and thought I had a handle on it, then took a class and realized I knew nothing. Classes really help you take control of your camera and take the images you want to take! After you take a class for manual exposure, expand your knowledge with more classes! 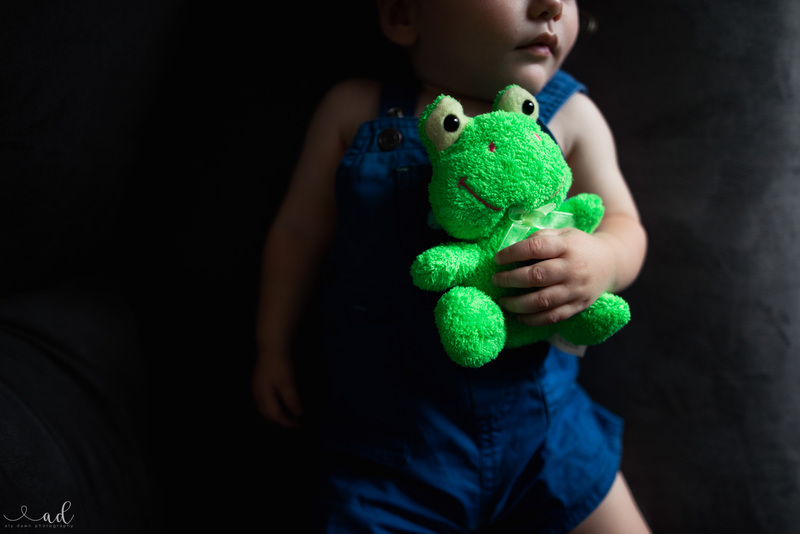 Try composition, natural light, and storytelling classes. I will be first to admit that taking a picture as often as you can (everday, preffered!) will help you so much. You might not notice it at first. But compare your images you took in January to the images you took this month. Big difference, right? I can definitely tell a difference in my images! And guess what? I love the images I took this month 10 times more than the ones I took in January. I got better. Shoot as often as you can. Take your camera with you everywhere. Photograph everything and anything. Experiment. Have fun. This is all a learning process and you need to practice in order to get better. I promise you will thank me one day for making you take pictures as often as you can! Shoot what you love, and love what you shoot. Don’t give up. Ask for help. Take classes. Seek out a mentor. Photography is an excellent hobby to get into and I hope you start! 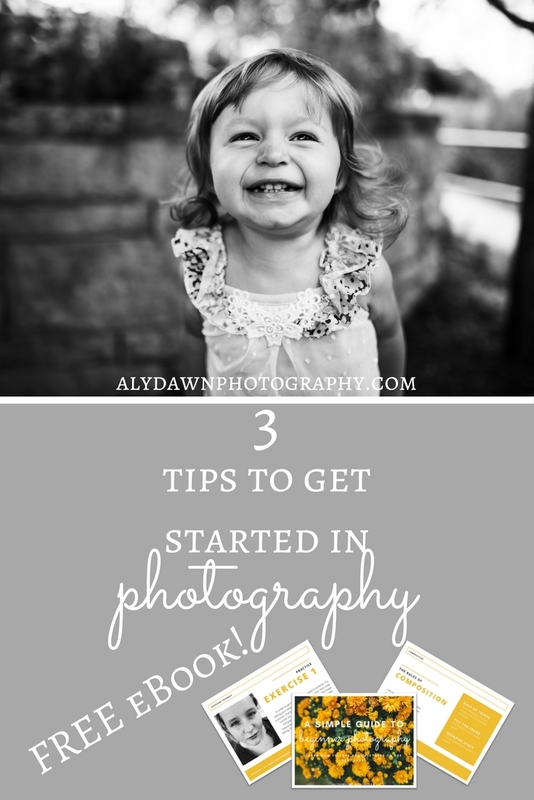 As an added bonus, I have created a Beginner Guide to Photography for you. And yes, it’s FREE! (I know, I’m so generous!) If you download it and read it, please leave a review down below in the comments. Also, please comment something that is holding you back in starting photography. What is something you need help with? I would love to hear all about it in the comments! 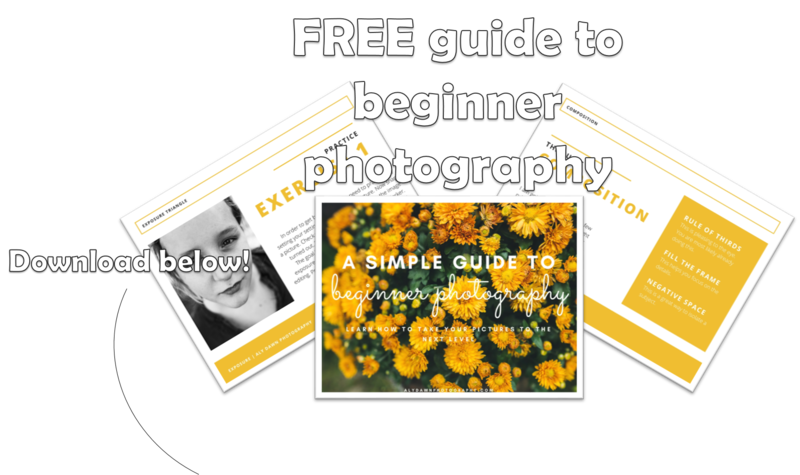 Download your FREE Beginner Guide to Photography here! Shortcuts make everything easier, am I right? I am about things to make my life easier. Lightroom shortcuts are amazing. They help get your work down in half the time. No joke! I love using these shortcuts to quickly edit pictures. And who wouldn’t want to quickly edit pictures? 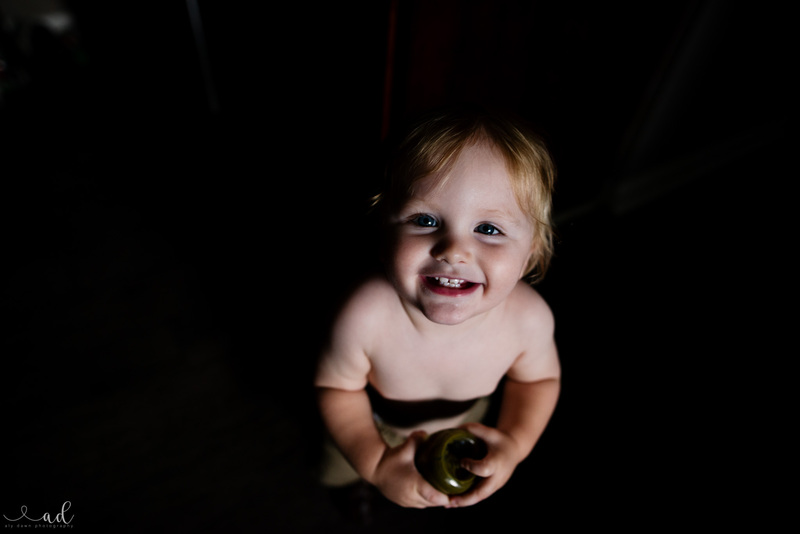 I love Lightroom for so many reasons. One of them is because of how easy Lightroom is to use. I will be honest, I started off a Photoshop only girl. But one of my friends convinced me to switch to Lightroom and I’m hooked. I don’t know what I’d do without Lightroom! Lightroom shortcuts make Lightroom my go to editing software. I only take an image into Photoshop if I have to. Like if I need to clone something horrendous out! But that doesn’t happen often. 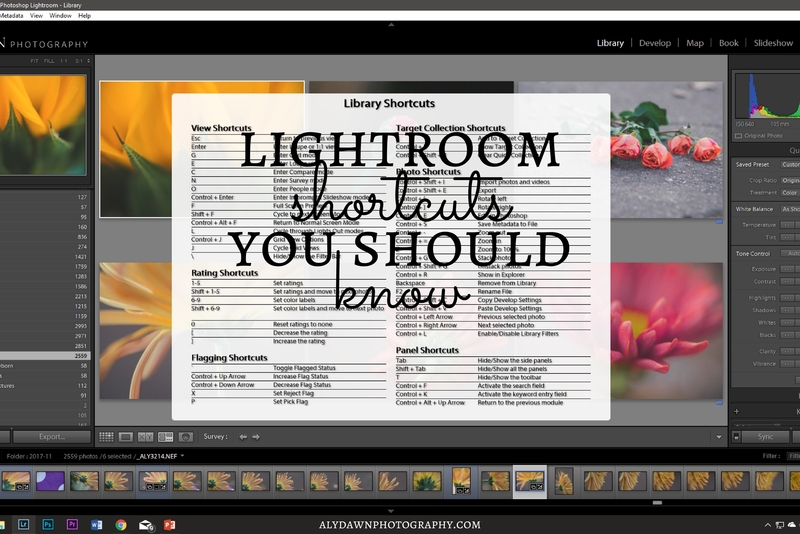 I hope you find these Lightroom shortcuts helpful and I hope they speed up your Lightroom and editing time! As I stated above, I love Lightroom! It is so easy to use. That is my number pro. It’s also easy to learn. And now, without further ado, I give you my handy list of shortcuts! I have tested and made sure each of these work! 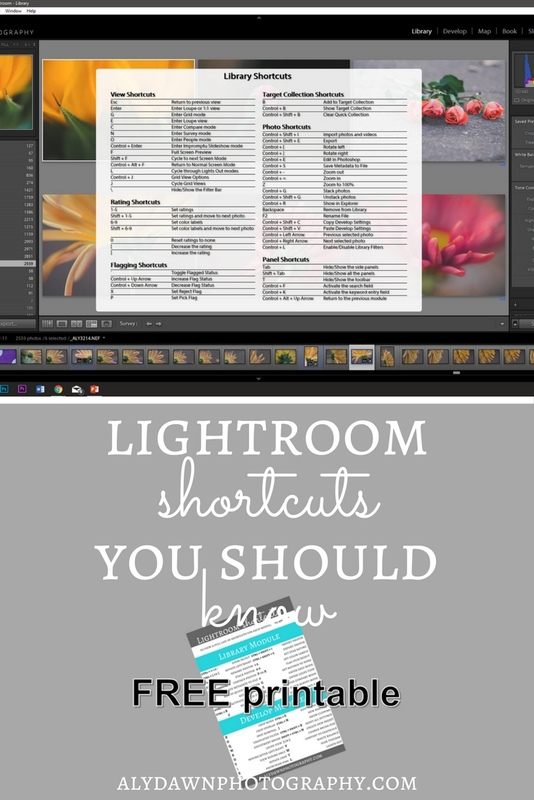 I use Lightroom Creative Cloud – if you have a different version of Lightroom, and these shortcuts don’t work, let me know in the comments below so I can update my list! Press Tab to hide side panels. Press L to enter in lights out mode. To switch to Library Module press Ctrl + Alt + 1 (Cmd + Option + 1). I just found this neat shortcut. If you press Ctrl + / (Cmd + / for Mac users) it will allow you to view a full list of shortcuts for each module. How neat is that? This shortcut expands beyond just the library module – it’s for each module that you are in. If you want to see a list of shortcuts for the develop module, make sure you are in the develop module! Easy peasy. Here’s a nice little shortcut that can save you about 2 seconds 😉 If you press Ctrl + Shift + I (Cmd + shift + E for Mac users) it will allow you to import your photos. I love using this. I sometimes get distracted with all the buttons available that it takes me a little while to find a certain button. With this shortcut, I don’t have to, and it really does help to save 2 seconds of my busy editing time! Just like with importing, if you press Ctrl + Shift + E (Cmd + Shift + E for Mac users) it will allow you to export your images. I use these shortcuts on a regular basis!! They help me when I cull my images. To set star ratings, simply press 1-5. I usually rate my images a 1 if I am unsure and a 5 for keeper. Of course, you can come up with your own work flow. To set color labels, press 6-9. This will change the boxes around your images to certain colors. My favorite is 9 – blue, which is my favorite color! I change all my editing, finished, and ready for export images to blue. Here’s one of my favorite tricks for Lightroom! I love setting my images as picks/rejects. How you do this is simply press P for a pick and X for a reject. I ‘reject’ any images that are for sure ones I need to delete. Missed focus, doesn’t tell a story, etc. Then I can go to Edit > Select by Flag > Rejected and have all of the ‘rejects’ highlighted and then deleting them all. Really quick & easy and now all of my complete rejects are gone! I love using the different view modes in the library modules. If you press G it will enter into Grid Mode, showing all of the images in that library in a grid. Get to look through a lot of images. If you press E it will enter into Loupe view, which is basically viewing one image at a time. If you press C it will enter into compare mode, where you can compare two of your images. This is great if you are trying to get your editing to be consistent. If you press N it will enter into Survey mode, which will allow you to press as many images as you’d like to survey and make sure they are consistent. I love this view. After I am done editing, I press all of my images and then N to see if they all look the same. Then if I need to tweak any, I can click on that image, switch to develop, and edit, then switch back to Library to see if the changes look more consistent with the other images. If you press = or – it will change the size of your grid thumbnails. To switch to the Develop Module, press Ctrl + Alt + 2 (Cmd + Option + 2). By pressing R it will bring the crop tool up, allowing you to crop right away. Then while in the crop tool, you can press X to rotate your crop view from landscape to portrait, and vice versa. Then if you would like to change the overlay of the crop, simply press O. This will cycle through some different crops, like the Rule of Thirds, the Golden Spiral, Golden Ratio, Golden Triangles, and more. While you’re in some of these crop overlays, you can also press Shift + O to rotate the crop view. Press Q to pull up the Spot Removal tool. Pressing M will bring up the Graduated Filter. Pressing K will bring up the Adjustment Brush. Pressing J will show your clippings, highlights or shadows. Pressing [ or ] will change the brush size (I sometimes find it annoying that Photoshop doesn’t have this shortcut!). Sometimes you have to take your image into Photoshop to ‘clean’ it up a bit. Lightroom, sadly, does not have the best cloning tool. If you press Ctrl + E it will pull your image into Photoshop for you to edit it there. The shortcut to create a new preset is Shift + Ctrl + N. If you aren’t making your own presets to help cut down on editing time, I highly recommend it! What are some things you struggle with and would like to know about Lightroom? Comment below! Also comment what your favorite shortcut is. 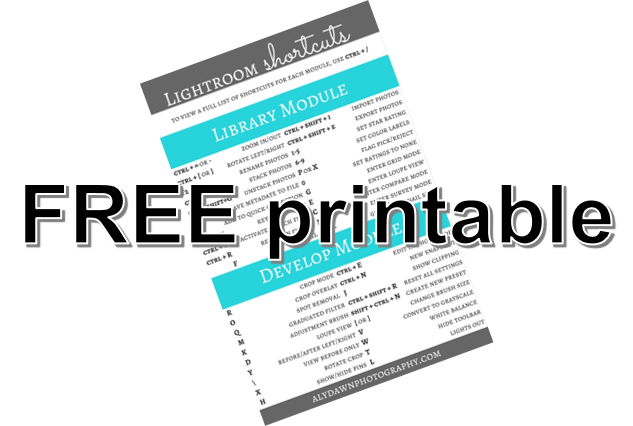 Along with this fancy little guide, I’ve created a FREE Shortcut Printable for you to print and hang near your computer. After you start using and implementing these shortcuts into your workflow, you’ll start remembering them instantly.